Today the 13th of March 2017 marks two years anniversary since Tropical Cyclone Pam hit Vanuatu in 2015. The National Disaster Management Office would like to take the opportunity to remember the destruction, devastation that was caused by the event and particularly those that lost their lives, that were injured and those that were displaced. 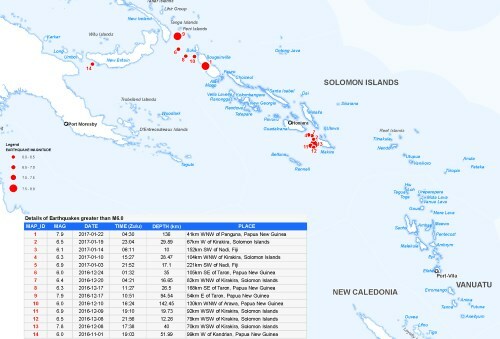 TC Pam was the strongest cyclone to hit Vanuatu and caused widespread damage across the country. The scale of the damage means that the country is still recovering from the effects two years later. The NDMO continues to work to improve the ability of the country to plan for, prepare for, respond to and recover from such disasters. We would like to remind communities, villages, partner agencies and individuals to remain vigilant during this cyclone season and keep yourself informed of the latest weather forecasts. For community information on preparing for disasters refer the the NDMO website here and for the latest weather forecasts and tropical cyclone outlook see the Vanuatu Meteorology website here. There have been 14 earthquakes greater than Magnitude 6.0 since November 2016. Over 9000 people affected and about 4000 houses damaged in Makira and Malaita provinces of Solomon Islands in December 2016. Other earthquakes did not cause major damage, however humanitarian partners in the region are monitoring the occurence of earthquakes and are on high alert for possible response. 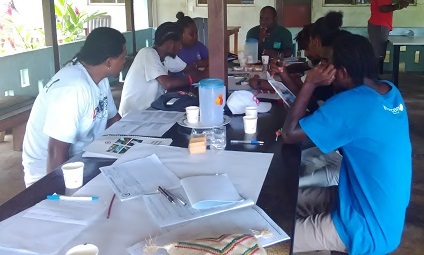 CARE International has been implementing community based Disaster Risk Reduction and Climate Change Adaptation (DRR & CCA) programs in the Tafea Province since 2011. The program was implemented in close coordination with the provincial government, including training and support for the Provincial Disaster and Climate Change Committee (PDCCC) and the National Disaster Management Office (NDMO), and in partnership with other agencies through the Yumi Redi Project Consortia. Developing a tailored Community Disaster Response Plan for each community was a central elements of the program. A year after tropical cyclone Pam, an independent study was commissioned to evaluate the impact of CARE’s DRR interventions and see if the DRR & CCA program had made a difference in a large scale emergency. The study gathered data from nine communities in Tafea Province on the islands of Aniwa, Erromango and Tanna. The study compares those communities that had the disaster preparedness initiatives versus those that had no such interventions. The study is unique in providing an evidence base for the Government of Vanuatu and partner agencies to further develop disaster risk management programming. For more information on the results of this DRR & CCA assessment please follow this link. 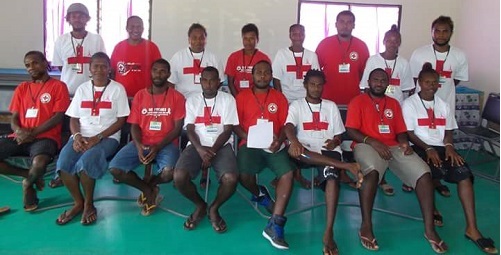 For the cyclone season from November 2016 to March 2017, the Sanma Red Cross - Emergency Response Team (ERT) alongside the Sanma NDMO office took the initiative to refresh the knowledge of its volunteers and others that are directly involved in Disaster work in Sanma province on Disaster Risk Reduction Principles. The Disaster Risk Reduction Principles refresher course which last a week was facilitated by the Red Cross Disaster Risk Reduction coordinator - Mr Agustine Karae. It has equiped the participants with the right knowledge that they can utilize to assist Sanma Community's should any disaster event occur in this cyclone season. As a co-facilitor, Mr Kensly Micah, the Sanma NDMO officer took this opportunity to inform the participants about the NDMO reporting and organizational structure to help the participants understand where to go to and what to do during a disaster event. With that he also introduced and explained how to use the Fes Komuniti Assessmen Fom. The knowledge gained from the refresher course should enable the participants to assist the Sanma Provincial Disaster committee to do assessments, response and distribute relief to affected victims of any disaster event.